Our faces aren’t the only place that show signs of aging. In fact, the hands can be one of the most prominent places that show signs of aging on our bodies. 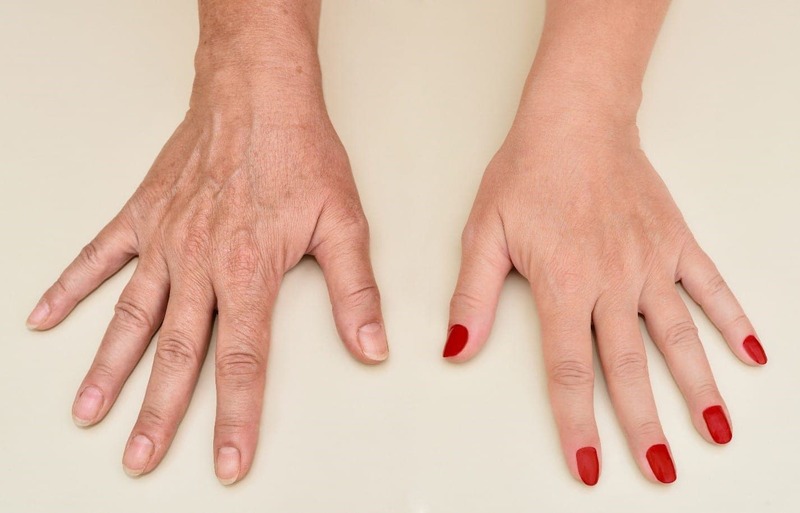 The hands are very susceptible to volume loss and deterioration as part of the aging process. Because our hands are always on display, many feel self-conscious about the look of their hands as volume loss takes place. Fortunately, there is now a nonsurgical solution to restore the hands of your youth! At Re:Nu 180 Med Spa in Southington, CT we offer hand rejuvenation with Restylane Lyft, an FDA-approved injectable for volume loss in the hands. The treatment is fast, safe, and requires little to no downtime. Restore your hands today! Book a consultation with us to learn more about hand rejuvenation at our Southington med spa! What is hand rejuvenation with Restylane Lyft? A common sign of aging is volume loss that leaves hollow areas in the face, hands, and other areas of the body as we age. Restylane Lyft works to address the root of this problem by delivering hyaluronic acid, a substance naturally produced by the body, back to areas effected by volume loss. What is the hand rejuvenation treatment like? At Re:Nu 180 in Southington we take great care to make sure your hand rejuvenation treatment is comfortable and tailored to the results you want. Prior to treatment our medical director, Christina Baden, will conduct a consultation with you to understand your concerns and goals of treatment. Based on your concerns and the amount of volume loss in your hands, we will recommend a treatment plan and will answer any questions you may have about hand rejuvenation treatment.Before treatment we numb the areas of the hand to be treated with a topical cream to ensure minimal to no discomfort. Our practitioner will then administer a series of injections to different areas of the hand. The hand rejuvenation treatment with Restylane Lyft is quick and generally takes under 30 minutes. After the injection process is complete the area treated will be massaged. Side effects are generally minimal*, but can include redness, bruising, swelling, or tenderness. Side effects generally resolve within hours to days following treatment. No downtime is required after hand rejuvenation treatment with Restylane Lyft and you can return to most normal activities right away. We can answer any questions you may have about treatment and side effects during your consultation and will provide you with aftercare instructions following your appointment. One of the benefits of hand rejuvenation treatment with Restylane Lyft is that results are apparent right away! With proper aftercare, you can expect to enjoy the results of your hand rejuvenation treatment for 6 months or more. At this time, we recommend following up with subsequent treatments to maintain desired results. Treatment can be repeated every six months and upkeep on treatments may prolong results. How do I Learn More About Hand Rejuvenation Treatment with Restylane Lyft? If you are ready to restore the hands of your youth but don’t want to undergo surgery, there are options for you that can provide exceptional results! Our hand rejuvenation treatment with Restylane Lyft is fast, safe, effective, and long-lasting. Our Southington patients have been extremely satisfied with the results they have seen from treatment. To learn about hand rejuvenation with Restylane Lyft at Re:Nu 180 Med Spa in Southington, CT and to learn more about our other aesthetic services, book a consultation with us today! We are excited to be apart of your journey to looking and feeling your best. *Disclaimer: Individual results may vary. Any pictures or information presented do not guarantee results, experience, or patient candidacy for treatment. A comprehensive consultation and medical exam is required before any treatment or procedure at Re:Nu 180 Med Spa.